The trip starts with a visit to beautiful Ettal Monastery, followed by a drive through Garmisch-Partenkirchen and on to Eibsee where we will take a cablecar to the summit of the Zugspitze (9.788 ft.). 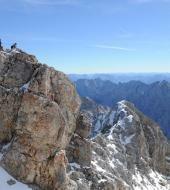 On a clear day, you can see over a thousand Bavarian, Austrian, Swiss and Italian mountain peaks at once. We will then descend down the mountain by cogwheel train.